According to general doctrine  canceroselectivity of Cyclophosphamide is based on different activities of the 4-hydroxycyclophosphamide (OHCP) detoxifying cellular enzyme aldehyde dehydrogenase in tumor and normal cells. Aldehyde dehydrogenase converts the OHCP tautomere aldophosphamide (ALDO) to the non-cytotoxic carboxyphosphamide. Due to different activities of the detoxifying enzyme more cytotoxic phosporamide mustard (PAM) is spontaneously released from OHCP/ALDO in tumor cells. PAM unfolds its cytotoxic activity by forming intrastrand and interstrand DNA crosslinks. This hypothesis is supported by in vitro experiments which show inverse correlations of aldehyde dehydrogenase activity and sensitivity of tumor cells against activated congeners of cyclophosphamide like mafosfamide which hydrolyses within a few minutes to OHCP. In protein free rat serum ultrafiltrate however free OHCP and its coexisting tautomer ALDO are stable compounds. Its half-life in protein free rat serum ultrafiltrate (pH7, 37oC) is more than 20 h. Contrary to protein free ultrafiltrate in whole serum ALDO is enzymatically decomposed to PAM and 3-hydroxypropionaldehyde (HPA) within minutes. The decomposing enzyme was identified as 3´-5´ phosphodiesterase, the Michaelis constant was determined to be 10-3 M in human serum. The experiments presented clearly demonstrate that ALDO is not only cleaved base catalyzed yielding acrolein and PAM [2, 3] but also cleaved enzymatically by serum phosphodiesterases yielding HPA and PAM. It is discussed that the reason of the high canceroselectivity of cyclophosphamide is not only due to enrichment of OHCP/ALDO in tumor cells due to less detoxification of ALDO in tumor cells than in normal cells. It is discussed that there is a good reason for an additional mechanism namely the amplification of apoptosis of PAM damaged cells by HPA. A two step mechanism for the mechanism of action of OHCP/ALDO is discussed. During the first step, the DNA is damaged by alkylation by PAM. During the second step the cell containing damaged DNA is eliminated by apoptosis, supported by HPA. Keywords: 4-hydroxycyclophosphamide, Enzymatic decomposition, 3´-5´ phosphodiesterases, Phosphoramide mustard, 3-hydroxypropionaldehyde. According to Sladek [4Sládek, N.E. ; Kollander, R.; Sreerama, L.; Kiang, D.T. Cellular levels of aldehyde dehydrogenases (ALDH1A1 and ALDH3A1) as predictors of therapeutic responses to cyclophosphamide-based chemotherapy of breast cancer: A retrospective study. Rational individualization of oxazaphosphorine-based cancer chemotherapeutic regimens. Cancer Chemother. Pharmacol., 2002, 49(4), 309-321. [http://dx.doi.org/10.1007/s00280-001-0412-4] [PMID: 11914911] ] the canceroselectivity of CP is based on different activities of the OHCP detoxifying cellular enzyme aldehyde dehydrogenase in tumor and normal cells. Aldehyde dehydrogenase converts the OHCP tautomere ALDO to the non-cytotoxic carboxyphosphamide. Carboxyphosphamide is the major CP metabolite found in urine. Due to these different activities of the detoxifying enzyme more toxic PAM is spontaneously released from OHCP/ALDO in tumor cells. This hypothesis is supported by in vitro experiments which show inverse correlations of aldehyde dehydrogenase activity and sensitivity of tumor cells against activated congeners of CP like mafosfamide (MF) [5Sladek, N.E. ; Landkamer, G.J. Restoration of sensitivity to oxazaphosphorines by inhibitors of aldehyde dehydrogenase activity in cultured oxazaphosphorine-resistant L1210 and cross-linking agent-resistant P388 cell lines. Cancer Res., 1985, 45(4), 1549-1555. [PMID: 3978623] ]. MF hydrolyses within a few minutes to OHCP. A further experimental finding which supports the “Sladek hypotesis” is that oxazaphosphorine resistant cells become sensitive when they are treated with inhibitors of aldehyde dehydrogenase like disulfiram [5Sladek, N.E. ; Landkamer, G.J. Restoration of sensitivity to oxazaphosphorines by inhibitors of aldehyde dehydrogenase activity in cultured oxazaphosphorine-resistant L1210 and cross-linking agent-resistant P388 cell lines. Cancer Res., 1985, 45(4), 1549-1555. [PMID: 3978623] ]. All the above arguments refer to in vitro experiments. In vivo however free OHCP/ALDO is only transiently occurring before it is either detoxificated in the liver to carboxyphosphamide or bound at proteins [6Voelcker, G.; Giera, H.P. ; Jäger, L.; Hohorst, H.J. On the binding of cyclophosphamide and cyclophosphamide-metabolites to serum-albumin (authors transl). Z. Krebsforsch. Klin. Onkol. Cancer Res. Clin. Oncol., 1978, 91(2), 127-142. [http://dx.doi.org/10.1007/BF00284020] [PMID: 27021] ]. The free concentration of OHCP/ALDO is 10-7-10-8 M as determined by the equilibrium constant of protein bound OHCP [7Hohorst, H.J. ; Bielicki, L.; Voelcker, G. The enzymatic basis of cyclophosphamide specificity. Adv. Enzyme Regul., 1986, 25, 99-122. [http://dx.doi.org/10.1016/0065-2571(86)90010-5] [PMID: 3028054] ]. This concentration is too low for formation of cytotoxic concentrations of PAM by spontaneous decomposition of OHCP/ALDO. Therefore, the selective enrichment of PAM in tumor cells cannot be the sole reason for the high canceroselectivity of CP. Accordingly, the potential contribution of HPA for canceroselectivity of CP is discussed in this report. HPA is, apart from PAM, the second reaction product of enzymatic toxification of ALDO. Phosphoreamidemustard (N,N-Bis-(2-chlor-ethyl)-phosphoracidediamide) was obtained from Asta-Degussa (Bielefeld Germany), 4-hydroxycyclophosphamide (2-(Bis-(2-chlorethyl)-amino)-4hydroxy-tetrahydro-2H-1, 3, 2-oxazaphosphorin-2-oxidphosphorinan) was synthesized according to Peter and recrystallized twice prior to use [8Peter, G.; Wagner, T.; Hohorst, H.J. Studies on 4-hydroperoxycyclophosphamide (NSC-181815): a simple preparation method and its application for the synthesis of a new class of activated sulfur-containing cyclophosphamide (NSC-26271) derivatives. Cancer Treat. Rep., 1976, 60(4), 429-435. [PMID: 1277218] ], aldehyde dehydrogenase (EC 1.1.1.1. ), phosphodiesterase from snake venom (EC 3.1.4.1.) acidic- (EC 3.1.3.2.) and alkaline phosphatase (EC 3.1.3.1.) was purchased from Boehringer Manheim Germany, and adenosine-5`-monophosphate as well as adenosine-3`-monophosphate was bought from Serva Company Heidelberg Germany. HPLC determinations of aldehyde hydrazones were carried out as described previously [9Voelcker, G. Enhancement of antitumor activity of the oxazaphosphorine cytostatic SUM-IAP by N-methylformamide. J. Cancer Res. Clin. Oncol., 2016, 142(6), 1183-1189. [http://dx.doi.org/10.1007/s00432-016-2132-5] [PMID: 26941190] ]. Enzymatic determination of 3-hydroxypropionaldehyde was analyzed by photometric NADPH measurement at 340 nm: 0.1 ml NADP 20 mM, 0.2 ml aldehyde dehydrogenase 25 U/ml and 0.1 ml 4-hydroxycyclophosphamide 1-10 mM were added to 0.5 ml of 0.07M phosphate buffer pH 7. The reaction was started by adding 0.1 ml of enzyme solution (serum, phosphodiesterase). 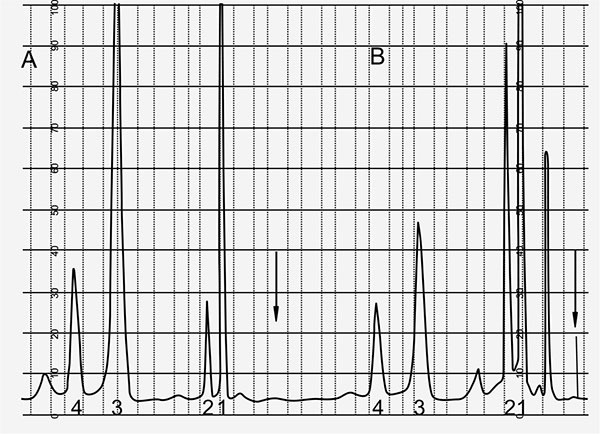 The concentration of 4-hydroxycyclophosphamide, aldophosphamide and phosphoreamidemustard was determined either directly by HPLC or after precipitation of proteins by HPLC as described previously [7Hohorst, H.J. ; Bielicki, L.; Voelcker, G. The enzymatic basis of cyclophosphamide specificity. Adv. Enzyme Regul., 1986, 25, 99-122. According to Low [2Low, J.E. ; Borch, R.F. ; Sladek, N.E. Conversion of 4-hydroperoxycyclophosphamide and 4-hydroxycyclophosphamide to phosphoramide mustard and acrolein mediated by bifunctional catalysis. Cancer Res., 1982, 42(3), 830-837. [PMID: 7059981] , 3Low, J.E. ; Borch, R.F. ; Sladek, N.E. Further studies on the conversion of 4-hydroxyoxazaphosphorines to reactive mustards and acrolein in inorganic buffers. Cancer Res., 1983, 43(12 Pt 1), 5815-5820. [PMID: 6640533] ] secondary phosphate ions and to an lesser extend bicarbonate ions catalyze the spontaneous decomposition of OHCP to PAM. To test the phosphate buffer mediated decomposition of OHCP/ALDO increasing concentrations of phosphate buffer were added to the serum ultrafiltrate. 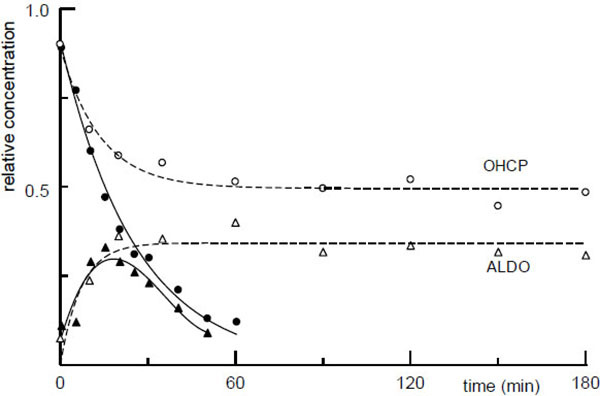 The decrease of OHCP/ALDO was measured by HPLC as demonstrated in Fig. 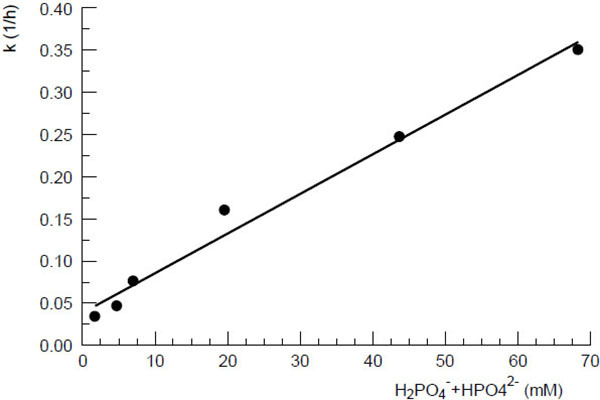 (2a ) which shows the HPLC protocol of aliquots taken from the incubation mixture of OHCP in 0.07 M Phosphate buffer. Formation of PAM from OHCP/ALDO as a function of concentration of H2PO4-+ HPO42-, in protein free rat serum ultrafiltrate pH7, 37°C. k(1/h) is the first order rate constant of the formation of PAM form 4-OHCP. 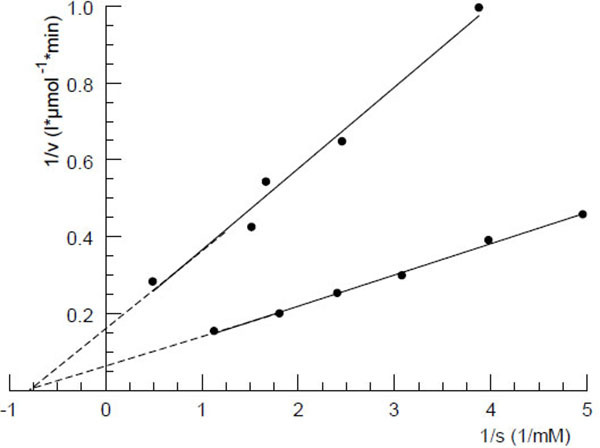 According to the first order rate constant resulting from the ion concentration in in protein free rat serum ultrafiltrate (intersection of the line with the ordinate in Fig. (1 )) the half-life of OHCP decomposition is calculated to be 23 hours. This value is in good agreement with the half-life of approximately 20 h which is determined for the decay of the tautomers OHCP/ALDO in rat serum ultrafiltrate (broken lines (Fig. 2 )). This result shows that under in vivo conditions OCHP/ALDO a is stable compounds, from which only insignificant amounts of the cytotoxic alkylating agent PAM is released. Another result of the experiment, in which OHCP was incubated in rat serum ultrafiltrate is that approximately 30 min after start of incubation an equilibrium between OHCP and its tautomer ALDO has formed (broken lines (Fig. 2 ) and HPLC protocol (Fig. 2a )). Formation of ALDO (Δ) from OHCP (○, concentration 100 mM)) in protein free rat serum ultrafiltrate (broken lines) and disintegration of OHCP (●, concentration 70 mM) and ALDO (▲) in rat serum (solid lines) pH7, 37oC. HPLC determination of OHCP and ALDO. HPLC protocol of the formation of ALDO (2) from OHCP (1) in 0.07M phosphate buffer (pH7, 37oC), arrows indicate start of HPLC run. Contrary to the incubation in serum ultrafiltrate the tautomers OHCP/ALDO disintegrate in serum with a half-life of 20 min (Fig. (2 ) solid lines). This is a strong indication that OHCP/ALDO is decomposed enzymatically. Fig. (3 ) shows the Lineweaver-Burk plot of the phosphodiesterase catalyzed decomposition reaction of OHCP/ALDO by human serum. Similar plots were achieved with dog- and rat serum. The Michaelis constants calculated from the plots were 2.5, 1.3 and 1.0 mM for serum samples from rat, dog and human, respectively. In order to identify the OHCP/ALDO splitting serum enzyme experiments with commercially available phosphoric ester-cleaving enzymes were carried out. The experiments showed that only 3`-5`phosphodiesterases like snake venom phosphodiesterase (EC3.1.4.1) (Fig. 4 ) and 3,5' cAMP phosphodiesterase (EC3.1.4.17.) from bovine heart, but not acidic- (EC3.1.3.2.) or alkaline phosphatases (EC3.1.3.1.) or phosphoprotein phosphatase (EC3.1.3.2.) show OHCP/ALDO splitting activity. From this and the fact that the enzymatic decomposition of OHCP/ALDO is inhibited by the specific inhibitor of 3`-5`exonucleases i.e. the 5`AMP and not by the 3'-mononucleotide 3`AMP (Fig. 4 ). It has been concluded that the OHCP/ALDO splitting enzyme is a 3`-5`exonuclease [7Hohorst, H.J. ; Bielicki, L.; Voelcker, G. The enzymatic basis of cyclophosphamide specificity. Adv. Enzyme Regul., 1986, 25, 99-122. Lineweaver-Burk plot for decomposition of OHCP/ALDO by human serum. Start of reaction by adding 50µl or 100µl (lower line) human serum. Photometric determination of NADPH+H+ after addition of human serum to a solution containing NADP, aldehyde dehydrogenase and OHCP in phosphate buffer. Lineweaver-Burk plot for enzymatic decomposition of OHCP/ALDO by snake venom phosphodiesterase (EC 3.1.4.1.) (●) and effect of 5`AMP (▲) and 3`AMP (■) on decomposition activity. Photometric determination of NADPH+H+ after addition of snake venom phosphodiesterase to a solution containing NADP, aldehyde dehydrogenase and OHCP in phosphate buffer. Fig. (5 ) shows the record of HPLC runs 10 and 90 min after start of incubation of OHCP/ALDO in rat serum. After protein precipitation samples were treated with 2,4-dinitrophenylhydrazine. The hydrazones of the aldehydes in the incubation samples were analyzed by HPLC. In both the samples 3-hydroxypropionaldehyde (HPA) is detectable indicating that ALDO is the substrate for the splitting by phosphodiesterases. Based on these findings the enzymatic decomposition reaction of ALDO is according to the reaction sequence outlined in Fig. (6 ). Acrolein is detectable right from the start of the incubation and it probably resembles a byproduct produced during the reaction of OHCP/ALDO with 2.4-dinitrophenylhydrazine. 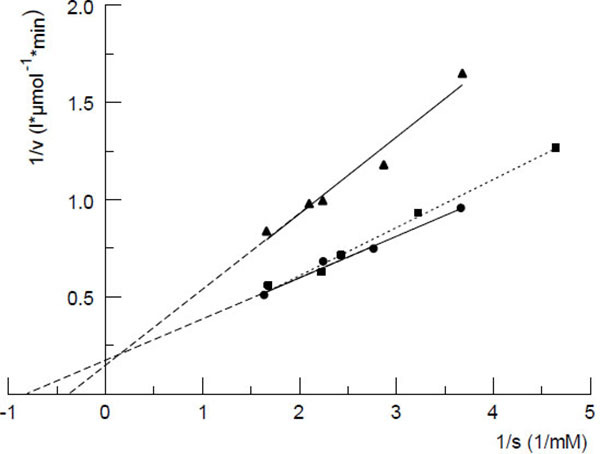 HPLC analysis of aliquots of OHCP incubated in rat serum (pH7, 37°C) for 10 min (A) or 90 min (B). Proteinprecipitation and reaction of the aldehydes with 2,4 dinitrophenylhydrazine. 1: 2,4 dinitrophenylhydrazine, 2,3,4: dinitrophenylhydrazones of hydroxypropanal (2), aldophosphamide (3) and acrolein (4). Arrows indicate start of HPLC run. Reaction scheme for enzymatic decomposition of OHCP/ALDO by phosphodiesterases (PDE), 1 OHCP, 1a ALDO, 2 PAM, 3 3-hydroxypropionaldehyd. X represents decay products of PAM, k1 and k2 are the first order rate constants for decay of OHCP and PAM, k1 and k2 where determined to be 0.038 min-1 and 0.016 min-1, respectively. If OHCP is incubated in rat serum the theoretical curve for PAM calculated with these values is congruent with the experimentally determined curve of PAM, indicating that stoichiometric amounts of PAM without byproducts are formed. The effect of OHCP/ALDO on tumor cells can be divided into 2 steps. During the first step, the DNA is damaged by alkylation by PAM. During the second step, the cell containing damaged DNA is eliminated by apoptosis. Schwartz and Waxman [10Schwartz, P.S. ; Waxman, D.J. Cyclophosphamide induces caspase 9-dependent apoptosis in 9L tumor cells. Mol. Pharmacol., 2001, 60(6), 1268-1279. [PMID: 11723234] ] investigated the effect of OHCP on the caspase 8 (extrinsic) and caspase 9 (intrinsic) dependent pathways of apoptosis in 9L tumor cells and 9L tumor cells transduced with CYP2B6, the latter is a liver P450 enzyme that hydroxylates CP to OHCP. For their experiments with wild type 9L cells they used MF. Contrary to other anticancer drugs like doxorubicin [11Fulda, S.; Susin, S.A.; Kroemer, G.; Debatin, K.M. Molecular ordering of apoptosis induced by anticancer drugs in neuroblastoma cells. Cancer Res., 1998, 58(19), 4453-4460. [PMID: 9766678] ] and cisplatin [12Seki, K.; Yoshikawa, H.; Shiiki, K.; Hamada, Y.; Akamatsu, N.; Tasaka, K. Cisplatin (CDDP) specifically induces apoptosis via sequential activation of caspase-8, -3 and -6 in osteosarcoma. Cancer Chemother harmacol., 2000, 45(3), 199-206.] in which activation of caspase 8 is the initial apoptotic event, after application of OHCP, activation of caspase 9 was detectable before the activation of caspase 8. In addition, caspase 9 was activated to a greater extent than caspase 8, indicating the p53 mediated apoptotic pathway, in response to upstream DNA damage, is triggered by OHCP. This finding is in agreement with the report that caspase 8 specific inhibitors only block cisplatin but not CP induced apoptosis [12Seki, K.; Yoshikawa, H.; Shiiki, K.; Hamada, Y.; Akamatsu, N.; Tasaka, K. Cisplatin (CDDP) specifically induces apoptosis via sequential activation of caspase-8, -3 and -6 in osteosarcoma. Cancer Chemother harmacol., 2000, 45(3), 199-206.]. The intrinsic apoptose pathway is regulated by the pro apoptotic protein Bax and by the anti-apoptotic protein Bcl-x. Bax opens the voltage dependent anion channel (VDAC) in the outer membrane of the mitochondrium and allows cytochrome c to enter the cytoplasm. Here, it activates procaspase 9 which initiates the activation of the caspase cascade. Bcl-x prevents the formation of the cascade by closing the VDAC. In the functional mechanism of alkylating agents, Schwartz and Waxman [10Schwartz, P.S. ; Waxman, D.J. Cyclophosphamide induces caspase 9-dependent apoptosis in 9L tumor cells. Mol. Pharmacol., 2001, 60(6), 1268-1279. [PMID: 11723234] ] distinguish between a cytostatic and a cytotoxic effect. In 9L cells, overexpressing the anti-apoptotic Bcl-2 protein, they could only determine the cytostatic effect after treatment with MF but no cytotoxic apoptosis. They state that the combination of OHCP induced DNA damage and Bcl-2 dependent cytotoxic response is necessary for cell death. The mentioned reports clearly demonstrate that the functional mechanism of OHCP is bimodal: First occurs the cytostatic DNA damage by PAM and, secondly, the cytotoxic p53 mediated apoptosis is observed. The second step is critical because it can be manipulated by factors that affect the pathway of apoptosis. Such a factor is very likely HPA, one of the two reaction products of the enzymatic decomposition of OHCP. HPA, also known as reuterin, is produced by Lactobacillus reuteri and submitted to the culture medium. It has been shown to be active against bacteria viruses and fungi [13Cleusix, V.; Lacroix, C.; Vollenweider, S.; Duboux, M.; Le Blay, G. Inhibitory activity spectrum of reuterin produced by Lactobacillus reuteri against intestinal bacteria. BMC Microbiol., 2007, 7, 101. [http://dx.doi.org/10.1186/1471-2180-7-101] [PMID: 17997816] ], it is used as food additive to prevent spoilage by growth of pathogens. Experiments by Iyer [14Iyer, C.; Kosters, A.; Sethi, G.; Kunnumakkara, A.B. ; Aggarwal, B.B. ; Versalovic, J. Probiotic Lactobacillus reuteri promotes TNF-induced apoptosis in human myeloid leukemia-derived cells by modulation of NF-kappaB and MAPK signalling. Cell. Microbiol., 2008, 10(7), 1442-1452. [http://dx.doi.org/10.1111/j.1462-5822.2008.01137.x] [PMID: 18331465] ], who investigated the effects of the supernatant of L. reuteri cultures (LR) on tumor necrosis factor (TNF)-activated apoptose signaling pathways in human leukemia cells, showed that reuterin inhibits (i) the formation of the anti-apoptotic proteins Bcl-2 and Bcl-xL and (ii) the TNF dependent NF-κB activation by inhibition of the translocation of the p65 subunit of NF-κB into the nucleus. The experiments of Iyer et al. further showed that the degradation of IκBα by lack of the ubiquitination of IκBα is suppressed by the supernatant of LR. Thus, by the inhibition of the nuclear translocation of NF-κB apoptosis is enhanced [15Wu, M.; Lee, H.; Bellas, R.E. ; Schauer, S.L. ; Arsura, M.; Katz, D.; FitzGerald, M.J.; Rothstein, T.L. ; Sherr, D.H.; Sonenshein, G.E. Inhibition of NF-kappaB/Rel induces apoptosis of murine B cells. EMBO J., 1996, 15(17), 4682-4690. Within the 105 cytostatica combinations mentioned in “ Chemotherapy regimen” (Wikipedia, the free encyclopedia) 39 contain CP or Ifosfamide. Of these cytostatica combinations, 22 contain the glucocorticoid Prednisone or Dexametasone. Considering that, the high glucocorticoid concentration causes the binding of the NFκB subunit to the monomeric glucocorticoid-receptor complex and thus decreases the transcription of genes activated by NF-κB [16Müller-Esterl, W. Biochemie, 2nd ed; Spektrum Akademischer Verlag: Heidelberg, 2011. ]. Accordingly, glucocorticoids enhance the pro apoptotic effect necessary for cytotoxicity of OHCP reaction products. The evidence that HPA is really an apoptogenic aldehyde like malondialdehyde or 4-hydroxynonenal [17Fournet, G.; Martin, G.; Quash, G. α,β-Acetylenic amino thiolester inhibitors of aldehyde dehydrogenases 1&3: Suppressors of apoptogenic aldehyde oxidation and activators of apoptosis. Curr. Med. Chem., 2013, 20(4), 527-533. [PMID: 23231347] ] is still pending but the experiments of Iyer [14Iyer, C.; Kosters, A.; Sethi, G.; Kunnumakkara, A.B. ; Aggarwal, B.B. ; Versalovic, J. Probiotic Lactobacillus reuteri promotes TNF-induced apoptosis in human myeloid leukemia-derived cells by modulation of NF-kappaB and MAPK signalling. Cell. Microbiol., 2008, 10(7), 1442-1452. [http://dx.doi.org/10.1111/j.1462-5822.2008.01137.x] [PMID: 18331465] ] are suggestive for this function. Reuterin is produced in the gastrointestinal tract. Bindels [18Bindels, L.B. ; Neyrinck, A.M.; Salazar, N.; Taminiau, B.; Druart, C.; Muccioli, G.G. ; François, E.; Blecker, C.; Richel, A.; Daube, G.; Mahillon, J.; de los Reyes-Gavilán, C.G. ; Cani, P.D. ; Delzenne, N.M. Non Digestible Oligosaccharides Modulate the Gut Microbiota to Control the Development of Leukemia and Associated Cachexia in Mice. PLoS One, 2015, 10(6), e0131009. [http://dx.doi.org/10.1371/journal.pone.0131009] [PMID: 26098097] ] investigated the influence of gut microbiota on the therapeutic management of cancer and associated cachexia in mice bearing intravenously transplanted leukemia cells. Mice were fed with a non-digestible carbohydrate containing Lactobacillus reuteri. Thirteen days after transplantation the L. reuteri treated mice exhibited decreased hepatic accumulation of leukaemia cells. In further experiments, Bindels demonstrated an increase in life span of 2 days and improvement of cachexia when leukaemia mice were treated with L. reuteri. One of the main causes of the development of cancer cachexia is the activation of the NF-κB pathway [19Argilés, J.M. ; Busquets, S.; Stemmler, B.; López-Soriano, F.J. Cancer cachexia: understanding the molecular basis. Nat. Rev. Cancer, 2014, 14(11), 754-762. [http://dx.doi.org/10.1038/nrc3829] [PMID: 25291291] ]. The inhibition of this signaling pathway by reuterine, which is released during the enzymatic decomposition of ALDO is a possible explanation for the anticachectic activity of CP [20Garattini, S.; Guaitani, A. Animal models for the study of cancer-induced anorexia. Cancer Treat. Rep., 1981, 65(Suppl. 5), 23-35. [PMID: 6955017] -22Grabiec, K.; Burchert, M.; Milewska, M.; Błaszczyk, M.; Grzelkowska-Kowalczyk, K. [Systemic and local mechanisms leading to cachexia in cancer]. Postepy Hig Med Dosw (Online), 2013, 67, 1397-1409. [Online]. [http://dx.doi.org/10.5604/17322693.1085135] [PMID: 24493689] ]. Bindels et al. [23Bindels, L.B. ; Neyrinck, A.M.; Claus, S.P. ; Le Roy, C.I. ; Grangette, C.; Pot, B.; Martinez, I.; Walter, J.; Cani, P.D. ; Delzenne, N.M. Synbiotic approach restores intestinal homeostasis and prolongs survival in leukaemic mice with cachexia. ISME J., 2016, 10(6), 1456-1470. [http://dx.doi.org/10.1038/ismej.2015.209] [PMID: 26613342] ] showed that homoeostasis of the gut microbiota is altered by tumors outside the gastrointestinal tract amongst others L. reuterie is reduced. By a synbiotic diet with L. reuterin and oligofructose derived from inulin, it was possible in two tumor cachexia models in mice to avoid the negative influence of the tumor on the gut microbiota. The animals were less cachectic and had a longer survival time than control animals without a synbiotic diet. The authors conclude from these experiments that the gut microbiota must be included as a target into the treatment of tumors. Other cell-damaging effects that support the cytotoxic effect of HPA are due to inhibition of ribonucleotide reductase which is required for DNA synthesis. HPA can dimerize. The dimeric form of HPA is structurally similar to ribose and specifically blocks the enzyme ribonucleotide reductase [24Talarico, T.L. ; Dobrogosz, W.J. Chemical characterization of an antimicrobial substance produced by Lactobacillus reuteri. Antimicrob. Agents Chemother., 1989, 33(5), 674-679. 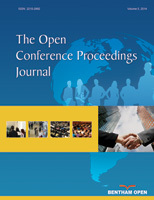 [http://dx.doi.org/10.1128/AAC.33.5.674] [PMID: 2751282] ]. Because the active site of the enzyme contains a thiol group it is not possible to distinguish weather HPA exerts its activity (a) by reaction of the highly reactive aldehyde group with the thiol groups or (b) as a competitive inhibitor of ribonucleotide reductase [25Schaefer, L.; Auchtung, T.A. ; Hermans, K.E. ; Whitehead, D.; Borhan, B.; Britton, R.A. The antimicrobial compound reuterin (3-hydroxypropionaldehyde) induces oxidative stress via interaction with thiol groups. Microbiology, 2010, 156(Pt 6), 1589-1599. In summary the cancerselectivity of oxazaphosphorine cytostatics can be increased by varying the structure of perhydrothiazinylphosphamidesters which spontaneously decompose to aldophosphamide derivatives [26Voelcker, G.; Bielicki, L.; Hohorst, H.J. Thiazolidinyl- and perhydrothiazinylphosphamidesters: toxicity and preliminary antitumour evaluation. J. Cancer Res. Clin. Oncol., 1997, 123(11-12), 623-631. [http://dx.doi.org/10.1007/s004320050116] [PMID: 9620221] ] with regard to the release of an appropriate apoptogenic aldehyde in the enzymatic decomposition reaction by phosphdiesterases. The demonstrated enzyme catalyzed decomposition of OHCP to PAM and HPA together with the enzymatic splitting of OHCP/ALDO by DNA polymerases with 3`-5`exonuclease activity verified by Hohorst et al. [7Hohorst, H.J. ; Bielicki, L.; Voelcker, G. The enzymatic basis of cyclophosphamide specificity. Adv. Enzyme Regul., 1986, 25, 99-122. [http://dx.doi.org/10.1016/0065-2571(86)90010-5] [PMID: 3028054] ] and the possible enrichment of PAM in tumor cells due to minor activity of aldehyde dehydrogenases are the predominant reasons of the remarkable canceroselectivity of CP. This report clearly demonstrates that ALDO is enzymatically cleaved yielding PAM and HPA, both of which are essential for the two step mechanism of action of oxazaphosphorine cytostatics. Based on this finding, new, more effective oxazaphosphorins can be developed in which DNA alkylation and subsequent apoptosis are optimally matched. Emadi, A.; Jones, R.J.; Brodsky, R.A. Cyclophosphamide and cancer: Golden anniversary. Nat. Rev. Clin. Oncol., 2009, 6(11), 638-647. Low, J.E. ; Borch, R.F. ; Sladek, N.E. Conversion of 4-hydroperoxycyclophosphamide and 4-hydroxycyclophosphamide to phosphoramide mustard and acrolein mediated by bifunctional catalysis. Cancer Res., 1982, 42(3), 830-837. Low, J.E. ; Borch, R.F. ; Sladek, N.E. Further studies on the conversion of 4-hydroxyoxazaphosphorines to reactive mustards and acrolein in inorganic buffers. Cancer Res., 1983, 43(12 Pt 1), 5815-5820. Sládek, N.E. ; Kollander, R.; Sreerama, L.; Kiang, D.T. Cellular levels of aldehyde dehydrogenases (ALDH1A1 and ALDH3A1) as predictors of therapeutic responses to cyclophosphamide-based chemotherapy of breast cancer: A retrospective study. Rational individualization of oxazaphosphorine-based cancer chemotherapeutic regimens. Cancer Chemother. Pharmacol., 2002, 49(4), 309-321. Sladek, N.E. ; Landkamer, G.J. Restoration of sensitivity to oxazaphosphorines by inhibitors of aldehyde dehydrogenase activity in cultured oxazaphosphorine-resistant L1210 and cross-linking agent-resistant P388 cell lines. Cancer Res., 1985, 45(4), 1549-1555. Voelcker, G.; Giera, H.P. ; Jäger, L.; Hohorst, H.J. On the binding of cyclophosphamide and cyclophosphamide-metabolites to serum-albumin (authors transl). Z. Krebsforsch. Klin. Onkol. Cancer Res. Clin. Oncol., 1978, 91(2), 127-142. Hohorst, H.J. ; Bielicki, L.; Voelcker, G. The enzymatic basis of cyclophosphamide specificity. Adv. Enzyme Regul., 1986, 25, 99-122. Peter, G.; Wagner, T.; Hohorst, H.J. Studies on 4-hydroperoxycyclophosphamide (NSC-181815): a simple preparation method and its application for the synthesis of a new class of activated sulfur-containing cyclophosphamide (NSC-26271) derivatives. Cancer Treat. Rep., 1976, 60(4), 429-435. Voelcker, G. Enhancement of antitumor activity of the oxazaphosphorine cytostatic SUM-IAP by N-methylformamide. J. Cancer Res. Clin. Oncol., 2016, 142(6), 1183-1189. Schwartz, P.S. ; Waxman, D.J. Cyclophosphamide induces caspase 9-dependent apoptosis in 9L tumor cells. Mol. Pharmacol., 2001, 60(6), 1268-1279. Fulda, S.; Susin, S.A.; Kroemer, G.; Debatin, K.M. Molecular ordering of apoptosis induced by anticancer drugs in neuroblastoma cells. Cancer Res., 1998, 58(19), 4453-4460. Seki, K.; Yoshikawa, H.; Shiiki, K.; Hamada, Y.; Akamatsu, N.; Tasaka, K. Cisplatin (CDDP) specifically induces apoptosis via sequential activation of caspase-8, -3 and -6 in osteosarcoma. Cancer Chemother harmacol., 2000, 45(3), 199-206. Cleusix, V.; Lacroix, C.; Vollenweider, S.; Duboux, M.; Le Blay, G. Inhibitory activity spectrum of reuterin produced by Lactobacillus reuteri against intestinal bacteria. BMC Microbiol., 2007, 7, 101. Iyer, C.; Kosters, A.; Sethi, G.; Kunnumakkara, A.B. ; Aggarwal, B.B. ; Versalovic, J. Probiotic Lactobacillus reuteri promotes TNF-induced apoptosis in human myeloid leukemia-derived cells by modulation of NF-kappaB and MAPK signalling. Cell. Microbiol., 2008, 10(7), 1442-1452. Wu, M.; Lee, H.; Bellas, R.E. ; Schauer, S.L. ; Arsura, M.; Katz, D.; FitzGerald, M.J.; Rothstein, T.L. ; Sherr, D.H.; Sonenshein, G.E. Inhibition of NF-kappaB/Rel induces apoptosis of murine B cells. EMBO J., 1996, 15(17), 4682-4690. Müller-Esterl, W. Biochemie, 2nd ed; Spektrum Akademischer Verlag: Heidelberg, 2011. Fournet, G.; Martin, G.; Quash, G. α,β-Acetylenic amino thiolester inhibitors of aldehyde dehydrogenases 1&3: Suppressors of apoptogenic aldehyde oxidation and activators of apoptosis. Curr. Med. Chem., 2013, 20(4), 527-533. Bindels, L.B. ; Neyrinck, A.M.; Salazar, N.; Taminiau, B.; Druart, C.; Muccioli, G.G. ; François, E.; Blecker, C.; Richel, A.; Daube, G.; Mahillon, J.; de los Reyes-Gavilán, C.G. ; Cani, P.D. ; Delzenne, N.M. Non Digestible Oligosaccharides Modulate the Gut Microbiota to Control the Development of Leukemia and Associated Cachexia in Mice. PLoS One, 2015, 10(6), e0131009. Argilés, J.M. ; Busquets, S.; Stemmler, B.; López-Soriano, F.J. Cancer cachexia: understanding the molecular basis. Nat. Rev. Cancer, 2014, 14(11), 754-762. Garattini, S.; Guaitani, A. Animal models for the study of cancer-induced anorexia. Cancer Treat. Rep., 1981, 65(Suppl. 5), 23-35. Tanaka, Y.; Eda, H.; Fujimoto, K.; Tanaka, T.; Ishikawa, T.; Ishitsuka, H. Anticachectic activity of 5-deoxy-5-fluorouridine in a murine tumor cachexia model, colon 26 adenocarcinoma. Cancer Res., 1990, 50(15), 4528-4532. Grabiec, K.; Burchert, M.; Milewska, M.; Błaszczyk, M.; Grzelkowska-Kowalczyk, K. [Systemic and local mechanisms leading to cachexia in cancer]. Postepy Hig Med Dosw (Online), 2013, 67, 1397-1409. [Online]. Bindels, L.B. ; Neyrinck, A.M.; Claus, S.P. ; Le Roy, C.I. ; Grangette, C.; Pot, B.; Martinez, I.; Walter, J.; Cani, P.D. ; Delzenne, N.M. Synbiotic approach restores intestinal homeostasis and prolongs survival in leukaemic mice with cachexia. ISME J., 2016, 10(6), 1456-1470. Talarico, T.L. ; Dobrogosz, W.J. Chemical characterization of an antimicrobial substance produced by Lactobacillus reuteri. Antimicrob. Agents Chemother., 1989, 33(5), 674-679. Schaefer, L.; Auchtung, T.A. ; Hermans, K.E. ; Whitehead, D.; Borhan, B.; Britton, R.A. The antimicrobial compound reuterin (3-hydroxypropionaldehyde) induces oxidative stress via interaction with thiol groups. Microbiology, 2010, 156(Pt 6), 1589-1599. Voelcker, G.; Bielicki, L.; Hohorst, H.J. Thiazolidinyl- and perhydrothiazinylphosphamidesters: toxicity and preliminary antitumour evaluation. J. Cancer Res. Clin. Oncol., 1997, 123(11-12), 623-631.